lxi+184 pages with diagrams, plate, tables and index. Octavo (8" x 5 3/4") issued in blue cloth with gilt lettering to cover and spine. Edited and translated by Christopher Becker. Caissa limited editions, volume 4. Number 362 of 700 copies published. Errata laid in. 1st edition. Written around 1800 and ready for the print, this manuscript has remained unpublished until the present day. 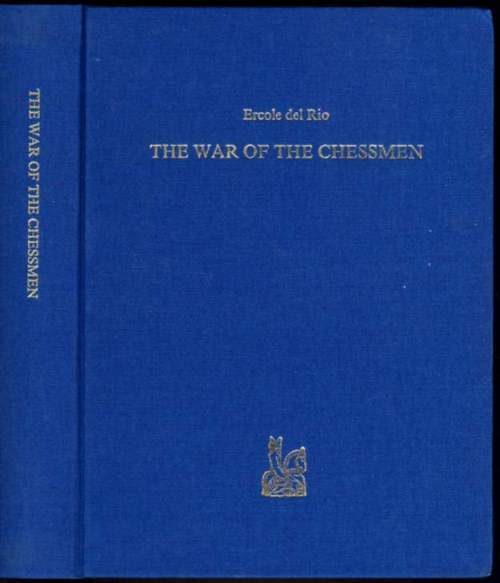 In the 1840's the great reputation of the "Anonymous Modenese", as del Rio was called, made the manuscript much sought after, and Borsari, its owner, lurks mysteriously in the background of one of Willard Fiske's chess tales. But its contents remained a mystery, and modern chess developed without their help, though not with out help from the already published works of del Rio and the other masters of Modena, Lolli and Poziani. Now part of the John G White's collection in the Cleveland Public Library. Page ends lightly soiled. A very good to fine copy without jacket as issued.